“God made the bulk; surfaces were invented by the devil”, a Nobel prize winning physicist Wolfgang Ernst Pauli said. In tribology, as in many other sciences, surface features (asperities, roughness) play an important role. In many cases, the surface roughness dramatically alters the friction, contact area, wear, etc. and the quotation from the famous scientist truly apply. In other cases, surfaces can be regarded as ideally smooth without significant errors. 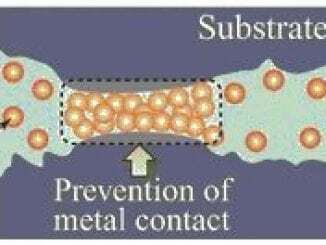 The real contact area (typically much smaller than the apparent) is responsible for the amount of friction developed in the contact and therefore is of high interest in tribology. The surface roughness significantly affects the behavior of the contact area as a function of load. Hertz theory, established more than a century ago, states that contact area is proportional to the applied load non-linearly: . Numerical simulation results showed, on the other hand, that in presence of the surface roughness, in many cases there is a linear dependence: . Recently, researchers from Karlsruhe Institute of Technology and Johns Hopkins University performed large scale molecular dynamic simulations to reveal the dependance of the contact area on normal load for a sphere with imposed fractal roughness. They varied the radii of curvature of the sphere from 30nm to 30 and normal load across 10 orders of magnitude. Based on the results, the researchers distinguished three regions of various functional dependence of the contact area on load. 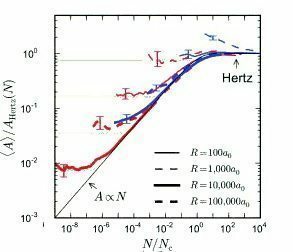 At the loads higher than the critical load (the equation for its calculation was provided in the article), the macroscopic Hertz theory was found to be accurate. The theory holds, since the deformation of the surfaces is much larger than the roughness scale and the surface come into full contact. At very low loads, the contact is fully determined by the first asperity in contact. In this case, the Hertz theory is valid again, if applied locally on the asperity level. Transition from this region to the intermediate (multi-asperity) can be also estimated with the same equation with only changing the macroscopic radius to the asperity radius. 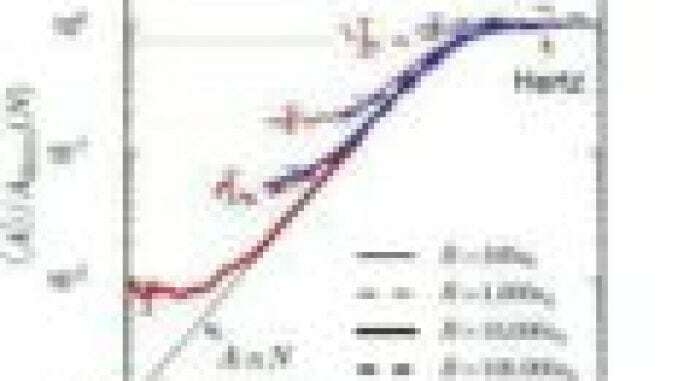 In the intermediate region, the linear relation holds due to multi-asperity contact. Besides, the researchers included the influence of adhesion, which becomes important at nanoscale and adjusted the corresponding scaling equations. A good agreement of the proposed equations with molecular dynamic simulations was observed. These simple equations can be used to distinguish the contact regimes to describe experimental results (as Atomic Force Microscope data) and employ corresponding contact models. The details of the research can be found in the original article: Lars Pastewka, Mark O. Robbins, ontact area of rough spheres: Large scale simulations and simple scaling laws; Appl. Phys. Lett. 108, 221601 (2016); http://dx.doi.org/10.1063/1.4950802. Credit for image: Edited with permissions from Appl. Phys. Lett. 108, 221601 (2016); http://dx.doi.org/10.1063/1.4950802. The equations presented neglect to consider the contribution (generated) HEAT makes to the interfacial contact dynamics. In my opinion, it is the HEAT generated in the contact that will decide the resulting dynamics of the surface deformations. Did I miss heat in the formulas? To be more clear regarding the above, I am suggesting that “contact mechanics” (deformation of interacting solids) must be properly viewed in terms of an “energy transfer” event. According to conservation of energy principles, that means the energy transfer (between the interacting bodies) will take the form of BOTH force (work) AND heat. If this is true, HEAT cannot be neglected from the equation. Around 1798, it was Count Rumford that noticed that cannon firing blanks got hotter than cannon firing cannonballs! Here they considered the static and fully elastic cases, so they neglected the heat generation, which in many problems is safe to do. Even if there is sliding, but not too fast (or not highly loaded, not high friction), the temperature rise is not significant at the asperity level. So the equations they derived can be helpful for fast assessments of the contacting conditions. 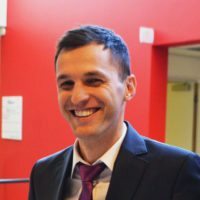 “Even if there is sliding, but not too fast (or not highly loaded, not high friction), the temperature rise is not significant at the asperity level.” My suggestion is that it is significant, despite the general belief in the tribology community that the heat may be safely neglected from the calculations. I suggest, as I did before, that heat generation at the (nanoscopic) asperity level is poorly understood. With relatively recent discussions of the existence of “triboplasma” events, I again suggest that heat is integral to all discussions (and calculations) of tribological interactions; as these interactions, however “static” or “fully elastic” in appearance, must be properly seen as “energy transfer” events. This is a conceptual argument! 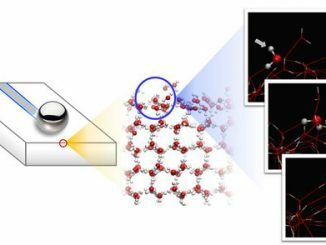 Once the interactions are viewed in the proper (physical) light, we can begin to completely understand the events at the nanoscale and their contributions (however seemingly insignificant at the macroscale) to friction and wear. The temperature rise can be there, but sometimes it is very small, or its influence is localized to the atomic scale. 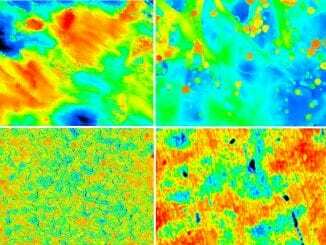 At the scale of AFM tip, the temperature influence on the deformation behavior will be small. Then, the equations they proposed can be used. “The temperature rise can be there, but sometimes it is…localized to the atomic scale.” Exactly! When we better understand those dynamics, we will be able to properly extrapolate any experimental data and not continue to misapprehend the actual (ever-present) contribution HEAT has to all failure scenarios.